SAN ANGELO, Texas — Terry Mills launched her debut album last year and is on the verge of releasing a music video, but she isn't quitting her day job. Mills has worked as a paralegal the past 30 years but has dabbled in music since she was a child, singing with her five siblings on road trips, playing the piano and, as a teenager, taking on the guitar to learn "House of the Rising Sun." "I think my mom was the one who (thought) that would be good education for her kids, to get a good background in music," said Mills, who is originally from El Paso. "I think having a background in music and piano helps you understand how things are structured; it's a great foundation. I'm really glad I had to take piano first. For me it was always about, 'Wow I really like that song, how can I learn that?' "
Mills' day job also fulfills her craving for challenge, she said. "I'm not really a morning person, so if we schedule an 8 o'clock meeting, I'll be there, but I'm not sure how much of me will be there," Mills said. "I like the challenge of the job; it's been a great job for me. I've met a lot of people, and I've worked for a lot of people who have helped me develop as a paralegal." Still, she said, it's a different environment than the artsy scene of which she's a part as a folk singer. "I work in a very conservative world, and I play in a creative world," she said. "Sometimes we get a little off balance in one, but I think everybody has a left brain and right brain; it's just being able to use them (both) and use them well." For Mills, that hasn't been a problem. The two worlds in which she lives complement each other, she said. "When I work and I'm so tired but I have a music rehearsal that's 2½ hours (long), it's amazing how much better I feel after that rehearsal because music unknots everything," Mills said. "In music, rarely do I ever multitask. You stay there and ride that melody and feel good." For the past five years, Mills has been a member of Acoustix with fellow musicians Kelly Wilson, an obstetrician, and Mark Stevenson, who is in a number of other local bands. "It's a very minimalist sort of band, and we'll play a lot of different genres, but we'll play a stripped down version of it to see if we can do it," she said. "I play some of my songs with them." Acoustix celebrated its anniversary with a party at Miss Hattie's in July, Mills said, following the June release of her music video for "Psycho Cat," from her album "Man Behind the Curtain." A link to the YouTube video has been posted on Mills' website, terrymillsmusic.com, "and I'm really, really hopeful that it'll go viral and bring in interest, that people will download 'Psycho Cat' on iTunes," she said. "With the Internet, you have to figure out how to get your songs out there." With the band's anniversary and the launch of her music video, "it seems like everything is coming together at once," Mills said. "I'm really excited about both of those things musically. "I loved music, I liked playing, and I never really set out to do anything with it. But over the last four or five years, it's just been like, 'Why not? Why not try that? Why not see where that goes?' "
Mills' philosophy of not expecting things to go a certain way — coupled with the fact that she doesn't have to survive off her music — have aided her well as a musician, she said. "When you are a professional musician, it's hard when music is the thing that has to make you money," she said. "But when it's something that you're able to do, it's something I feel like is an expression of my creativity or my perspective — there's not the expectation that it has to be anything" more. Mills writes songs, she said, because she feels she has something to say. "It's about trying to express what I saw happen or what I feel about a certain subject matter. Sometimes it's as silly as a cat; sometimes it's as deep as the way people hurt each other with words. It can be very abstract or concrete. It's trying to be truthful about how life is." There's freedom in not having a deadline for writing songs, she said. "I may have to work a little harder on this one, or this isn't working and I may have to scrap it," she said. "The whole point for me is, don't lose sight of what you're trying to say." But for every ingenue like Sahara Smith, who's produced by T-Bone Burnett, you have a songstress like Terry Mills, who will get her own fine album recorded in San Angelo and Nashville and mastered in Austin. Mills, Smith, and the artists mentioned below are all worth listening to at some point in your life. 3. 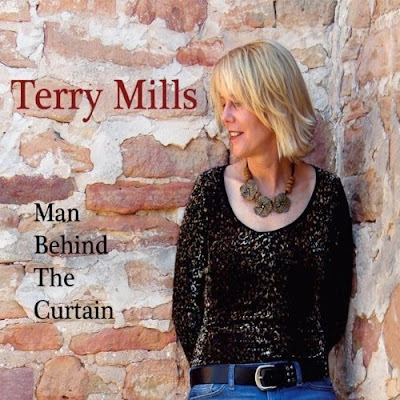 Man Behind The Curtain by Terry Mills. Mills, a singer-songwriter based in San Angelo (I just got back from there; what a co-inkydink) has several gems on this CD, especially "Psycho Cat", which will make anyone who has ever owned or been around a cat laugh out loud. "We're Related" also tickles the funny bone, but the artist also scores with more pensive fare ("The Cold, the Rain & Saturday", "Soar"). Although the last song on the CD, "Noel Y'all", feels like it belongs on a different album, this is a solid collection, and one that makes you appreciate how much unsung talent we have in the Lone Star State. Terry Mills has a sincere and earnest vocal delivery reminiscent of the best music of Lucinda Williams. Her new album "Man Behind The Curtain" takes the veil off a brand new music talent that will leave music fans eagerly anticipating her next release. Terry Mills has a cool, alt-country vibe on the first track "Island Girl," but the album really picks up steam with the Tracy Chapman meets Jewel track "Psycho Cat." The softer side of Mills is showcased on "Sunshine Boy." A bluesy, country sound is introduced on the title track "Man Behind The Curtain." Terry Mills seems most comfortable with this style, and she would be wise to consider recording a full album in this vein. "The Cold, The Rain & Saturday" offers a folk vocal from Terry Mills that continues to show her diversity. The finest track on the album and best chance for a country chart hit is "Robin Song." The production and vocals are pitch perfect. Likewise, the alt country "We're Related" is an amazing surprise blending Americana, gospel and traditional country. The cut "Comfort In Three-Quarter Time" (which would have been a great album title) introduces Terry Mills as country balladeer. "Defenseless" is sung with sincerity as is the tender "Soar." The album ends with an earnest folk track titled "Noel Y'all." The lyrics pierce the soul and would make Joni Mitchell proud. SAN ANGELO, Texas — Longtime San Angelo singer-songwriter Terry Mills has written and performed music for years, but she never gave much thought to making a CD until about five years ago. “Then, I started talking about it, but I never did anything about it,” Terry told me. Terry and friends will play for her CD release party and concert at 6:30 p.m. Thursday at the Chicken Farm Art Center, 2505 Martin Luther King. There is no charge for the outdoor event, which is a part of the art center’s 2nd Thursday Yard Concert series. We are welcome to bring our lawn chairs, ice coolers, food and drinks. Food also will be available for sale from the adjacent Silo House Restaurant. For information, call 653-4936. Her CDs will be sold at the concert. They also will be for sale beginning Thursday at terrymillsmusic.com and at Hastings in San Angelo. Terry’s no stranger to local fans of live music. “I’ve been playing in San Angelo since my daughter was 6, nearly 18 years,” said Terry, an El Paso native who moved here 20 years ago. “I found you could play most folk songs by learning only five chords. I jumped ship and never went back to the piano,” she said, smiling. Terry began writing her own music a few years later and sang publicly for the first time at age 16, at a wedding. But singing and songwriting were an “off and on” thing for Terry, who works as a paralegal, until she finally decided to make the CD. She had a little help from friends. Gary Laney, a former Nashville sound engineer who lives in San Angelo coproduced and recorded her CD. She recorded three of the CD’s 11 songs in Nashville with studio musicians. The other eight numbers were recorded in San Angelo, with local musicians, including Kelly Wilson and Mark Stevenson from Terry’s band, Acoustix, John Talley, David Alexander, Larry Ward, Dedra Knox and Tamara Rosini-Laney. And I challenge any parent with grown children to listen to “Soar” without getting teary eyed. It’s a beautiful ballad about Terry’s daughter, Jazz, leaving home to pursue a musical career in Austin. With her CD finished, what’s next? Terry said she has loved playing to live audiences and performing at smaller venues such as Sealy Flats, Miss Hattie’s, D’Vine Winery, Mesquite Bean Cafe and the Chicken Farm. “Playing live is fun. Playing live is connecting and communicating. We’re real fortunate that most of the people we play for really enjoy us. That makes it magical,” she said. I asked Terry if her new Nashville contacts might lead to a major artist recording one of her songs. She said she wouldn’t mind. “It would be great to have them send me a royalty check without me ever having to leave San Angelo,” she said, laughing. Terry Mills, a San Angelo, Texas paralegal who has written and performed her own songs for almost 20 years, hasn't given up her day job or sold all of her worldly goods yet, but she is releasing her first CD, Man Behind the Curtain, next week. You can listen to some of Mills' tunes at http://www.terrymillsmusic.com/. You know a paralegal wrote this song when it says, "Here's a flow chart for you to follow/He's married to the ex-wife of my ex-husband's ex-wife's boyfriend." Congratulations to Mills for making her dream come true, and for producing some great music. I especially love "Soar," which reminds me of my own daughters.